Drop off AND pickup available. Different types of rugs each come with their own unique issues and faults as they age. The most common repairs we see with hand knotted rugs is the Fringe deteriorating due to wear, everyday foot traffic or the vacuum cleaner sucking them up. Fringes are an extension of the warp foundations of the rug so it’s important not to just cut them off when they start to show signs of wear. We can neaten them up and hand tie a special running knot along the fringe to secure and prevent further rapid deterioration of your rug. It won’t last forever but it will certainly give you many more years to the life of your rug. Hand Knotted rugs usually have hand dyed wool fibres during the dyeing process the excess dye isn’t always fully removed and when a rug become wet from a leak/flood or maybe or was cleaned in the home and left wet you can find the excess dye can start to bleed into other fibres of the rug. This can be a permeant issue and irreversible if left for a long period of time. Another common cause for dye bleed can be caused by pet stains or alcoholic drinks this can cause a stable dye to become unstable and cause the dye to bleed. We have successfully removed dye bleed in a number of rugs but it isn’t a guaranteed process. General wear of Hand knotted rugs can also see damage caused to the side cords of the rug. This is where we would need to repair the edge of the rug. Mid way side cord detached from rug. This can happen when the weft foundations have snapped inside and no longer keep the side cord warps in place. We can reattach the side cord by putting in new supporting wefts. End side cord damage when this happens we quite often notice that not only has the side cord come away from the rug but it might have also lose a couple of the pile knots too. We can either hand bind the side cord to secure the rug so no further damage can happen then will leave a slight indentation depend how much of the pile has been lost but it will prevent any further damage. We can also rebuild the missing area of the damaged side this means putting in new Warp and Weft foundations and adding in new knots. This process is very intricate work and may not always be cost effect for the rug. Heavy furniture placed on top if a rug can cause a lot of pressure on the foundations of a hand knotted rug and can then lead to a hole developing in the middle of the rug. Another cause of holes in the middle could be down to moth damage where the wool fibres have been eaten away. There are several options when it come to securing/restoring a hole/tear. Depending on the condition of the rug and what has caused the hole there could be an option to secure or restore the hole. From putting a securing stitch around the area so it doesn’t get any worse to putting in new supporting warp and weft founds and re-weaving in new knots to create the pile. 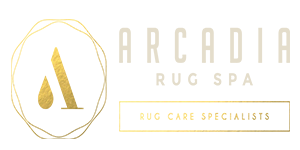 Please note: We provide you with several options for securing and restoration work, which will range from cost effective securing to extensive full restoration that you can choose from, that will suit both your budget and your rug. Quite often we see Machine woven rugs come in with missing fringe. Most of the time customers want the fringe removed and the end binding to make it nice and neat. 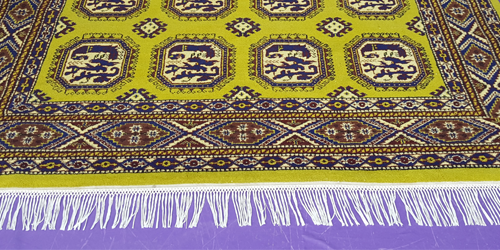 This is perfectly suitable with a machine woven rug as the fringe is usually sewn on at the end of production and isn’t part of the rugs foundation. We can simply bind the edge to match the side of the rug and the rug will look much better. However, some customers like the fringe and would like us to neaten it up or add a new fringe. While this is possible this may not be a cost-effective process. 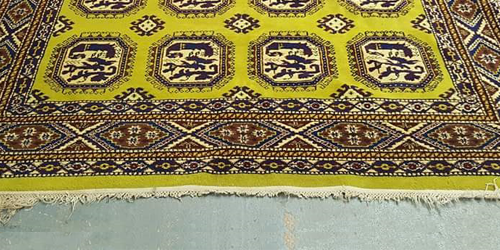 One of the most common repairs we see on machine woven rugs is the binding has worn and is starting to look unsightly. We can simply have the sides of the run re-bound and the rug will look renewed. Tufted rugs have a backing a piece of material that is glued to the back of the rug. Over time the glue in the rug breaks down due to wear and traffic build and sometimes we see this if an attempt to clean the rug has been made and the rug has taken a long time to dry the glue will perish and the backing becomes lose causing the rug to ruck up or you see lots of fine sand coloured dust coming from inside the rug. If you have purchased a designer tufted rug or the rug was fairly expensive it may be cost effective for us to remove the material backing completely and remove all the perished glue and the reapply the backing with our specialist rug glue that is far superior to the manufactures glue, Allowing you to continue using your rug like it was new again. Because the fibres of tufted rugs are not woven into any foundations they are prone to losing tufts, We may be able to replace the missing tufts with new ones created from our extension range of dyed wool. Colour Restoration for Wool, Silk and Nylon rugs. Pet urine accidents or shop bought stain treatment products can sometimes cause colour loss of the fibres of your rug. Depending on the condition of the fibre’s it is possible to restore the colour by re-dyeing the fibres, this helps to blend the area of colour loss and not have a large area of your rug with missing colour. Open 6 days a week, drop off and pickup available. See our areas we cover section for to see if we cover your area. If not, drop your rug off to us at our shop. Pick up the phone or send us an email with any questions you have.